Suspected herdsmen, late last night ambushed traders in Guma LGA of Benue State, killing many of them, including market women and children. DAILY POST gathered that the victims were returning from the popular Yelewata Market when the attackers laid ambush on them, hacking some of them to death and inflicting injuries on several others. 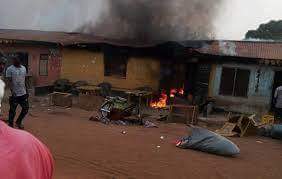 Earlier, the suspected herdsmen had attacked Tse Igbe at Nyiev Council Ward in Guma Benue State, killing one Christopher Unenge, a Catholic catechist and another villager identified as Ayem Mbakuughur and many others. Among those killed in the latest attack, DAILY POST gathered, was a man identified as Aondowase Uma, market women and some children. “They killed Aondowase Uma, many other persons and even injured four people who were returning from Yelewata Market last night. “As we speak, several persons are still missing; as at this morning, search is still ongoing,” a fleeing resident told our reporter Wednesday morning. Meanwhile, several calls to the Benue State Police Command Police Relations Officer, Moses Yamu, ASP, for comment were not responded.